At Barron, we offer three weeks of Accelerated classes to prepare for the Summer season. What are Accelerated Classes? 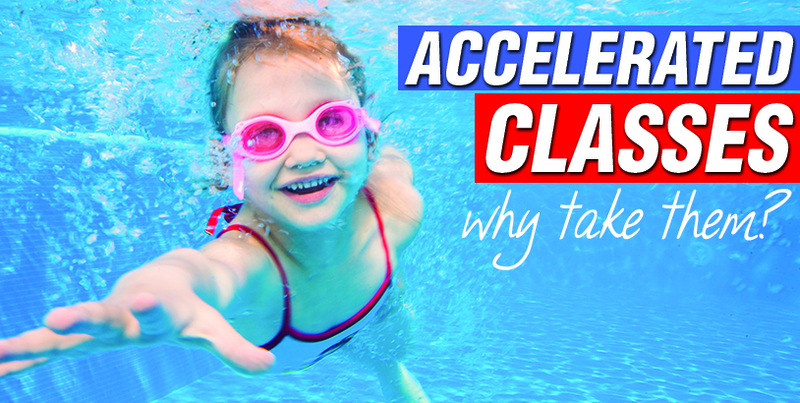 They are intensified swim lessons — you receive 5 lessons in one week as opposed to 4 lessons in a month. CONSISTENT TEACHER – Throughout the week, you will be provided the same teacher. Your child will gain a trusting relationship, which in turn leads to fantastic progress. Our teachers are trained to give all students an individualized experience and to challenge each child at a different pace. By taking a personalized approach, these classes help to cultivate the confidence that a child needs to learn the important life-saving skill of swimming. REPETITION – The greatest advantage to accelerated classes! Learning to swim takes a lot of repetition. Repetition is simply defined as the reoccurrence of an action or event. Swimming is very much a learned reaction and response. The same skills need to be done repeatedly to foster greater success. Accelerated classes provide the constant repetition throughout the week and help progress. EXTRA PRACTICE – Accelerated classes are a great compliment to your monthly lessons. The more instructional lessons and water time, the safer your child will be in and around the water. Memorial Weekend is right around the corner!